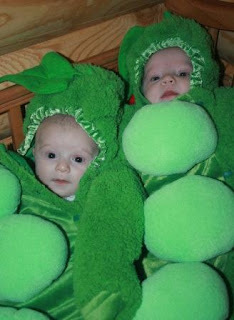 I guess back in my infancy, parents didn't really dress up babies for Halloween. Or if they did, they didn't waste film on the cuteness like they do today. At any rate, I have no pictures of myself before about age 4 or 5 in Halloween costume. 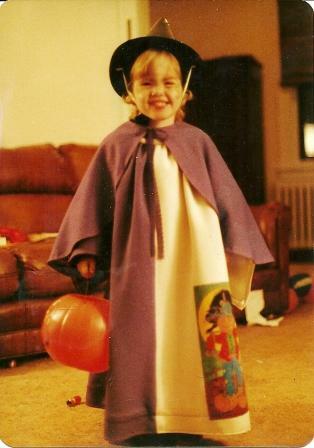 So the earliest pic I have is my witch costume, which my mom made for me. In addition to looking really green, my cheeks look really puffy, so I'm kind of wondering if I wasn't sick or something. It was about this age that my mom made the coolest ghost cake for my class at school! It had this delicious marshmallowy frosting, and the eyeballs were eggshells. She had put something in the eggshells that she lit on fire, and it made the eyes glow. I was fascinated by those eyes! The second picture I am the dog to the left with my friend Erin in the unicorn costume. 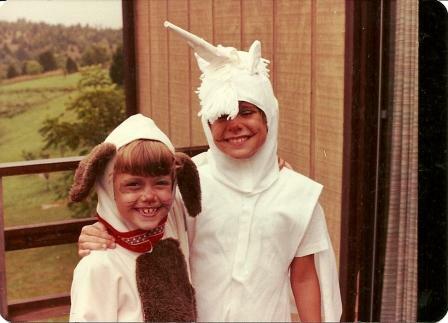 I loved my dog costume, but I loved that unicorn costume more, so my mom made me a horse costume the following year. This picture is from high school. My barn had a Halloween costume contest one year. 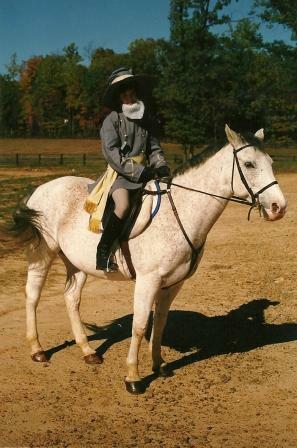 Chico and I went as Robert E Lee and Traveler. Yup, I spray painted his mane and tail with black - no worries, it washed out! Since I have no baby pictures of myself in costume, I offer up last year's peas in pods cuteness. Cort to the left, Reid to the right. They won second place in a costume contest at the mall. Not sure we'll be able to top that! If you'd like to join in Memory Lane Friday, it's easy! Grab the button from my side bar and add it to your post. Then come back and add your URL to McKLinky. Don't forget to go visit and comment on the other blogs! Next week's topic is A Spooky Story. I thought the horse and you as Robert E.Lee was so clever.. I love the idea for the Marshmallow cakes eyes...My halloween memories are so vivid because my mom loved this holiday and we always dressed up and had fun with the nieghbor kids.. Yes, pillow cases full were gathered with candy and yes we sorted them all out in categories. Halloween is coming and my pumpkins are painted.. I'll carve them nearer to the end of the month.. Sounds like your mom made the BEST cake! That would've been so cool to see! I love the Gen. Lee & Traveler costume! What neat costume pictures! The horse with paint - a great idea for its costume! I like the little peas, too!!! You were so cute in your picture! All the costumes were nice.